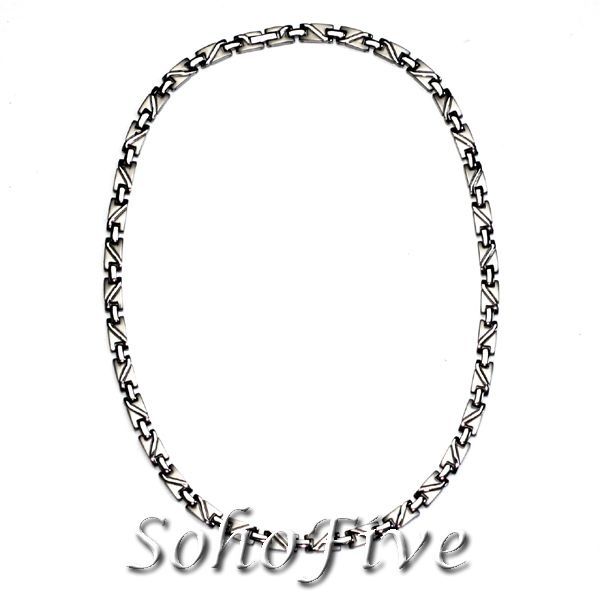 A huge collection of all the therapeutic magnetic bracelets and necklaces made of all kinds of materials including tungsten, titanium, stainless steel, copper, hematite, etc. are placed in one page for your convenient browsing and selecting. Sale Price: $23.99 Lady's Ceramic Magnetic Bracelet 8"
Lady's Hugs & Kisses Ceramic Magnetic Bracelet 7 7/8"
Sale Price: $23.99 Premium Tungsten Carbide Magnetic Bracelet 8 7/16"
Sale Price: $35.99 Tungsten Magnetic Bracelet 9 1/8"
Sale Price: $38.95 Tungsten Magnetic Bracelet with Carbon Fiber 9 1/8"
Gold Plated Tungsten Magnetic Bracelet with CZ Diamonds 7 7/8"
Sale Price: $38.99 Gold Plated Tungsten Magnetic Bracelet 7 7/8"
Sale Price: $39.99 Premium Tungsten Magnetic Bracelet 9 1/8"
Sale Price: $37.95 Tungsten Magnetic Bracelet 7 7/8"
Deluxe Tungsten Magnetic Bracelet 7 7/8"
Price: $179.95 Gold Trimmed Tungsten Magnetic Bracelet 7 7/8"
Price: $169.95 Ceramic Magnetic Bracelet 8 5/8"
Sale Price: $29.99 Ceramic Magnetic Bracelet 8 1/4"
Sale Price: $38.95 Premium Grade Tungsten Carbide Magnetic Bracelet 7 5/8"
Sale Price: $48.95 Gold Filled Tungsten Magnetic Bracelet 8 7/16"
Tungsten Magnetic Bracelet with Carbon Fiber 8 7/16"
Sale Price: $48.95 Tungsten Magnetic Bracelet 8 1/4"
Price: $169.95 Tungsten Magnetic Bracelet 8 3/8"
Premium Tungsten Magnetic Bracelet with CZ Diamonds 9 1/8"
Sale Price: $58.95 Lady's Tungsten Magnetic Bracelet with CZ Diamdons 8 3/4"
Sale Price: $37.95 Lady's Tungsten Magnetic Bracelet 8 1/4"
Price: $169.95 Tungsten Magnetic Bracelet 8 1/4"
Price: $179.95 Men's Tungsten Magnetic Bracelet 7 7/8"
Men's Tungsten Magnetic Bracelet 8 1/8"
Sale Price: $37.95 Men's Tungsten Magnetic Bracelet 7 7/8"
Sale Price: $35.95 Tungsten Magnetic Bracelet 7 7/8"
Sale Price: $34.99 Lady's Tungsten Magnetic Bracelet 7"
Price: $109.95 Deluxe Titanium Magnetic Bracelet 8"
Sale Price: $16.99 Wire Cuff Magnetic Bracelet 7 1/4"
Price: $29.99 Deluxe Titanium Diamond Necklace with Swarovski Accents 22"
Sale Price: $37.99 Magnetic Necklace 18"
Price: $139.99 Magnetic Necklace 18"
Price: $119.99 Magnetic Necklace 18 1/4"
Price: $129.99 Magnetic Necklace 18"
Price: $129.99 Gold Trimmed Magnetic Necklace 18"
Price: $129.99 Hugs & Kisses Magnetic Necklace 18 1/4"
Sale Price: $38.99 18K Gold Trimmed Magnetic Hearts Necklace 17 3/4"
Price: $139.99 Magnetic Necklace 17 3/4"
Price: $129.99 Magnetic Necklace 18 3/4"
Price: $129.99 Magnetic Necklace 18 1/4"
Hematite Magnetic Imitation Pearls Necklace 18.5"
Sale Price: $6.99 Magnetic Hematite Necklace 18.5"
Sale Price: $5.99 Magnetic Hematite & Semiprecious Beads Necklace 18"
Sale Price: $5.99 Magnetic Hematite Necklace 19"
Sale Price: $6.99 Magnetic Hematite Necklace 18"
Sale Price: $6.99 Hematite Magnetic Bracelet 7 1/4"
Sale Price: $2.99 Magnetic Hematite Bracelet 6.5"
Sale Price: $6.99 Magnetic Hematite Bracelet 6.75"
Sale Price: $4.99 Magnetic Hematite Bracelet 6.75"
Sale Price: $4.99 Magnetic Hematite Bracelet 7.25"
Magnetic Hematite Bracelet 7 3/4"
Sale Price: $4.99 Magnetic Hematite Bracelet 7.5"
Sale Price: $4.99 Magnetic Hematite Bracelet 7 3/4"
Sale Price: $4.99 Magnetic Hematite Bracelet 7 1/4"
Sale Price: $5.99 Shamballa Hematite Magnetic Bracelet 6" � 7.75"
Sale Price: $7.99 Hematite Magnetic Bracelet 7.25"
Sale Price: $4.99 Hematite Magnetic Bracelet 7.25"
Sale Price: $4.99 Hematite Magnetic Bracelet 6"
Sale Price: $3.99 Hematite Magnetic Bracelet 7"
Sale Price: $5.99 Magnetic Hematite Bracelet 6 1/2"
Sale Price: $5.99 Magnetic Hematite Bracelet 7 1/4"
Sale Price: $5.99 Hematite Magnetic Power Bracelet 7"
Sale Price: $5.99 Hematite Magnetic Bracelet 6"
Sale Price: $2.99 Hematite Magnetic Bracelet 6"
Price: $19.95 Hematite Magnetic Bracelet 6"
Sale Price: $2.99 Double Row Hematite Magnetic Bracelet 6 1/2"
Sale Price: $3.99 Double Row Hematite Magnetic Bracelet 6 1/2"
Jumbo Carnelian Bead Hematite Magnetic Bracelet 6 1/2"
Sale Price: $3.99 Double Row Catseye Beaded Hematite Magnetic Bracelet 6 1/4"
Sale Price: $3.99 Catseye Beaded Bracelet with Strong Hematite Bicone Magnets 7"
Sale Price: $5.99 Agate Beaded Bracelet with Strong Hemate Magnets 6 1/2"
Hematite Magnetic Bracelet 6 1/2"
Sale Price: $6.99 Hematite Magnetic Bracelet 6 1/4"
Hematite Magnetic Bracelet 6 3/4"
Hematite Magnetic Bracelet 7 1/2"
Sale Price: $5.99 Hematite Magnetic Fashion Bracelet 7 1/4"
Sale Price: $5.99 Magnetic Hematite Bracelet with Catseye Accents 8"
Sale Price: $5.99 Magnetic Hematite Fashion Bracelet 6 3/4"
Sale Price: $3.99 Hematite Magnetic Fashion Bracelet 7 3/4"
Sale Price: $6.99 Hematite Magnetic Bracelet with Coral Chips 7 1/4"
Onyx Beaded Hematite Magnetic Bracelet 6 1/4"
Sale Price: $5.99 Catseye Hematite Magnetic Bracelet 6 1/2"
Sale Price: $4.99 Magnetic Hematite Bracelet 6 3/4"
Sale Price: $6.99 Catseye Beaded Hematite Magnetic Bracelet 6 1/2"
Price: $19.99 Carnelian Magnetic Hematite Lariat 34 1/4"
Sale Price: $6.99 Aventurine Magnetic Hematite Lariat 31 1/4"
Price: $19.99 Snowflake Magnetic Hematite Lariat 33 1/2"
Sale Price: $8.99 Crystal Magnetic Hematite Lariat 31 3/8"
Price: $17.99 Magnetic Hematite Fashion Wrap Bracelet 35"
Price: $22.99 Hematite Magnetic Wrap Bracelet 34"
Sale Price: $7.99 Magnetic Hematite Fashion Wrap Bracelet 35"
Sale Price: $5.99 Magnetic Hematite Fashion Lariat 36"
Price: $19.99 Magnetic Hematite Fashion Lariat 35"
Hematite Magnetic Fashion Lariat 36"
Sale Price: $9.99 Hematite Magnetic Fashion Lariat 35"
Sale Price: $8.99 Magnetic Hematite Lariat with Howlite Chips 32"
Sale Price: $8.99 Hematite Magnetic Lariat with Black Onyx Chips 32"
Magnetic Hematite Lariat with Goldstone Chips 33"
Sale Price: $8.99 Cloisonne Beaded Magnetic Hematite Wrap Bracelet 32"
Sale Price: $12.99 Magnetic Hematite Lariat with Cloisonne 33"
Sale Price: $12.99 Magnetic Hematite Lariat with Freshwater Pearls 37"
Price: $28.99 Magnetic Hematite Lariat with Cloisonne 31"
Price: $27.99 Magnetic Hematite Lariat with Cloisonne 36"
Sale Price: $12.99 Magnetic Hematite Lariat 36"